Rule 9–Fair-weather riding is a luxury reserved for Sunday afternoons and wide boulevards. Those who ride in foul weather – be it cold, wet, or inordinately hot – are members of a special club of riders who, on the morning of a big ride, pull back the curtain to check the weather and, upon seeing rain falling from the skies, allow a wry smile to spread across their face. This is a rider who loves the work. This is about a rider who loves the work. @roadslave related this story to us when we first arrived in Belgium for the 2012 Keepers Tour. Peter Van Petegem always has that five o’clock shadow of a man who has to shave multiple times a day, so high is his god given Belgian testosterone level. As a racer he would ride in the far back of the peloton where everyone is told not to ride. Peter could read a race and he would only move up for crunch time- when it was time to win the sprint or join a break. 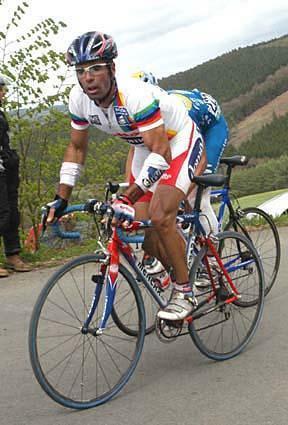 And win he did, he was two-time winner of Ronde van Vlaanderen and winner of Paris-Roubaix in 2003, completing the Ronde-Roubaix double. Him being Belgian, I doubt he gets to pay for many Abbey Ales. The doomed Mercury Viatel Cycling Team was a US team with European aspirations. Some of the best North American riders were hired to help complete a team that could compete with the big boys in Europe. And nothing helps like actually having one of the big boys on the team, so Peter Van Petegem was hired on to captain them through the Spring Classics in 2001. There must be hundreds of amazing stories that transpire on team buses and team cars, privy only to the riders, mechanics and managers within earshot. What follows is one that made it out (as related from @roadslave’s introduction below). So, before the race, we were huddled up in the Team Camper Van. I’d like to say Team Bus, but it really wasn’t. The weather was so bad the bus was rocking from side to side from the wind, and we could hardly hear each other speak because the rain drumming on the roof was so loud. Greg Lemond came in to see us, as we were riding his bikes that year. He’d just given an interview with some TV guys, and was soaked through: he looked like someone had turned a fire hose on him. He could hardly look us in the eye as he wished us good luck for the race. Then in came Peter Van Petegem, our team leader for our classics campaign that year. He was beaming this huge smile as he looked around the van, his eyes sparkling and his whole being literally glowing. “I like this weather!” he proclaimed. “It is good for us. Many of the weaker riders have already been defeated”. Suddenly the prospect of going out there and racing didn’t seem so bad. Sadly, 2001 was not to be our year: PvP got caught behind one too many crashes, and missed the decisive break – line honors that year went to Servais Knaven, and PvP ony managed 24th. It was not until 2003 that he won Paris-Roubaix, but his words that day confirmed to me that he was a true legend of our sport. Damn, I love the hell out of this story. This warms my heart. It completely confirmed my preconceived understanding of Van Petegem. I barely survived riding the business end of P-R, I can’t imagine riding it on a soaking wet, windy day, much less racing it, much less being psyched up for it! For all those hackneyed Hollywood locker room speeches I loath and American sports I don’t care a whit about, this story transcends all that nonsense and says much about Peter Van Petegem and our sport. Thanks to @roadslave and “The Stig” for bringing this to light. That’s an excellent tale, Gianni. I’m curious to see if I can figure out who the Stig is. @Belgian Cobblestones Cool, I saw a photo of Le Pave when I was searching the google images. That would be fun, staying there. What does his nickname mean in English? The unshaven dude from Brakel? I looked at the roster for the 2000 team but couldn’t be arsed to really go through each riders bio to figure it out, still, it shouldn’t be too hard. Did you change the top photo? Great story BTW. I remember watching a documentary on the Paris-Roubaix, by masterlink, ‘road to roubaix’, where they were talking/questioning how to appreciate P-R, and ride well at P-R, PvP said simply ‘you must love the stones…its the most important thing…eh’, and that said so much, as his boxer-style jaw…his sparkle in the eye, a slight smile…truly Belgian. Inspired by Pete V Pete. Love the Merckx. More enthused to ride new 54/44 setup and hunt down riders from the back. What a tale! Love it. To keep going back year after year blows my mind. Someone once said that to be a great high altitude climber you must have a very high pain threshhold and a short memory, or you would only climb one mountain. It must be the same for the lovers of the pave’. 54/44. That’ll learn ’em. I had a 53/44 on my old steel bike when I lived on a flatter part of the USA. The 44 is a mean mis-treater unless you are fit and warmed up. Then it rules, shifting up to the big ring when your small ring is a 44 is the best. No wonder a 44 or 46 inner ring was good for P-R. When I go back to visit me Ma I find myself on the 44 thinking what the hell is this? I never get out of the 44 x 23 for the first half hour of a ride. This past Vednesday ride went to 54 and 11. Felt like I was carrying a familiar weapon. The 44 is a brand new love. I’m going to guess this guy is the Stig. You are good. yeah, he lives in London now, punishes @roadslave on a weekly basis, it must be the Stig. Nice one Gianni, always was a big PvP fan, and hearing @roadslave 525 tell that story was pretty cool… glad you shared it with the community. Love that he did the double on the Team SC too, would love to get a Lotto frame to go with my Domo! And he’s possibly the only rider ever to pull off an all-white WC leader’s kit! @brett Yea, I think we need to hang out with him a bit. The Black one from Brakel. And yes on both counts, you do need a Lotto Merckx and that tough looking dude from Brakel could pull off the all white kit. Look at those damn guns. Thats a funny scene, Frank quoting Van Petegem at the gite. And Frank was right, sleet bouncing off your helmet cover, it was good for you all. You should probably see someone about this identity crisis thing you have going on. Great tale about PvP. Always liked the bloke. Comes across as casually deliberate about the whole racing thing whenever he speaks. that same scene came to mind as well when reading this. “you must love the stones” so matter of fact and full of nonchalance; the look on his face truly showed his character. Damn, PvP was a pretty good doner of ye olde cycling cap! And, now that a V-jersey is heading my way come TdF season I definitely need to pick up a clear gilet and rain cape. Can’t be covering that beauty up, gotta fly the team colours! Also…thar she is! The cool points leader jersey. Only think I’ve ever see it in wee badge mode on here. Looks great! Fantastic quote – “…the weaker riders have already been defeated”. Sums up my whole MTB season so far, don’t seem to be able to have a dry race so far this year! I did pay a heavy price on climbing. Loved hunting down the field from the back. Comebacks were swift and staggering. Planning to stay with 54/44 until at least October. I watched that movie at least once a week this winter while on the rollers. That scene was one of my favourites and seemed to make it easier to spend time on the rollers. Just thought I had to love them. At one point while watching the movie and riding the rollers, I started to day dream about gluing vinyl tiles to the rollers to help simulate the cobbles.